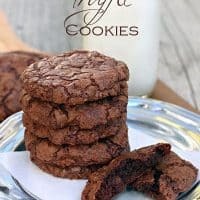 If you’re a chocoholic like I am–and especially if you’re a fan of rich, dark chocolate–you are going to love these Chocolate Truffle Cookies. They are pure chocolate decadence, with 20 ounces of melted dark chocolate in the batter and two cups of semisweet chips stirred in before baking. These decadent cookies have a chewy, truffle-like center and a slightly crispy outer coating, which is just the way I like my cookies. To achieve that signature crackly top, be sure to beat the batter well as you’re adding the eggs. But don’t beat too much as you add the flour, or the cookies with be tough. Also note that the batter firms up pretty quickly as the chocolate cools, so rather than forming the cookies as you go, it’s best to form them all right from the start, then bake them. If you really, really love dark chocolate, you can even use dark chips in place of the semi-sweet. Either way, you’re in for a real chocolate-lover’s treat! Preheat the oven to 350°F. Line 2-4 (as many as you have) baking sheets with parchment paper. Place the chopped chocolate in a heatproof bowl over a saucepan of very hot but not boiling water. Heat, stirring occasionally until the chocolate is melted and smooth. Remove the bowl from the water and cool for 5 to 10 minutes. Meanwhile, combine the butter and sugar in the bowl of an electric mixer with and beat on medium speed until well combined. Add the eggs, one at a time on medium speed, beating well after each addition. Increase the speed to high and beat for a few minutes until the mixture is very light and creamy. Add the melted, slightly cooled chocolate along with the vanilla extract and mix just until combined. With the mixer on low speed, gradually add the dry ingredients. Fold in the chocolate chips. Using a 1.5 inch cookie scoop, start forming the cookies as soon as you finish making the batter--it will firm up quickly as it sits. If possible, scoop all of the cookies before baking. Placed the scooped cookie dough onto the prepared baking sheets, about 2 inches apart. Using a slightly damp hand, flatten each cookie slightly with the palm of your hand. Bake for about 15 minutes, or until cookies are evenly cracked on top and just set. Remove from oven and cool on a wire rack for 5 minutes before removing cookies from pan. Who Dished It Up First: Adapted from In Sock Monkey Slippers. Wondering about adding a pinch of espresso powder. Not enough for “mocha” but to accent all that chocolate. Yum………. Talk about chocolate overload! These are amazing. I can’t wait to make these. Thanks for sharing. These cookies are seriously amazing!!! 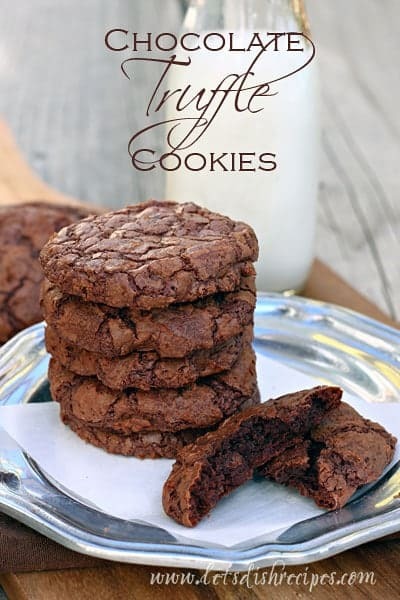 I will never need another chocolate cookie recipe! I baked mine for 14 min and I think I’ll try even shorter next time. Thanks for many great recipes!